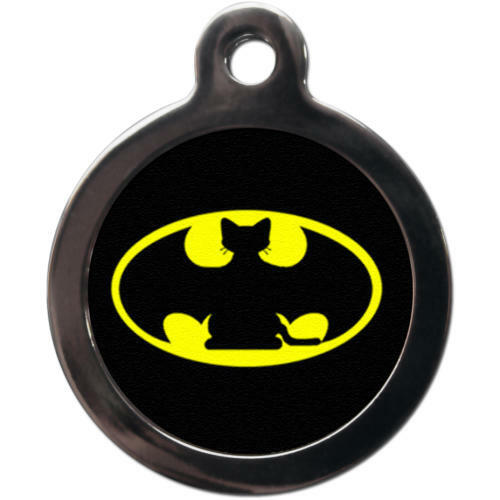 Perfect for caped crusader kitties everywhere, this Batcat ID tag from PS Pet Tags also features enough room for 4 lines of 25 character text, in case your fearless feline wanders too far to fight crime! PS Pet Tags are 24mm in diameter, and all personalisation is covered by a lifetime guarantee. These metal tags are nickel plated and waterproof, making them incredibly durable. Your PS Pet Tags ID tag will be dispatched separately from the rest of your order, and should reach you within 5 working days. Personalisation will be automatically centered and resized to fit. Text can be a mixture of capitals and lowercase, and will be printed onto the tag exactly as entered. If you are ordering from a mobile device we will contact you to collect the details of your personalisation.